I’ve also started wiring up the pots and switches. Finished the six-position switch last night, and after I finished I quadruple-checked the diagram. Now I’m worried. Maybe one of you who’ve already finished this can offer some input…here’s the deal: The diagram shows two terminals wired together for A, with the inner terminal G situated approximately right between the first and second terminal. I think I may have wired the terminals such that the “G” terminal is actually right below the FIRST terminal, and not between. In other words, the PATTERN of the wiring around the outer ring of terminals is precisely as it should be, but I have a sick feeling I may have started the sequence one terminal too early. To clarify further, if it were a clock face, I would have started at 1:00 and not 12:00 — or to use the lettering in the diagram, while the sequence of wiring is correct, I MAY have started it where the diagram shows F being wired. So my question is, if in fact this is what I did — and I’m not positive — does it matter? In other words, is it the SEQUENCE of the outer ring terminal connections that matters, and the switch will still work properly? Or if I actually started the sequence on the “F” terminal, do I need to get out my desoldering kit? The thing that galls me, of course, is the note right at the top of the page about checking your work very carefully on this step since errors are likely. And I can tell you I really did check it carefully. But carefully enough? Perhaps not. Perhaps I shouldn’t be working on this thing so late at night when everyone else at Problematic Audio is sleeping. Thanks to all who have been sharing — Olivier, the sample you posted sounds great! I will be traveling over the next week and so will not be able to work on the Gristlelizer nor post further updates until my return. I’ll be keeping my fingers crossed the entire time I’m away, and when I return to the Problematic Audio laboratory I hope my worst fears about that rotary switch will turn out to be completely irrelevant. Until then, good luck with your own projects. I just added the CV In and Out connections, it’s really easy to make, and really fun to control other devices synchronised with the Gristleizer! FYI, regarding the BYPASS switch, there are two errors on the full schematic diagram regarding its connections, but the switch’s wiring diagram in the instructions is correct. Label “A2”: should be the connection between switch SW2A and the INPUT jack’s tip. Label “B2”: should be the connection between switch SW2B and the OUTPUT jack’s tip. My Mouser order just arrived. I decided to order everything from them, including the “three-pole, four-position” rotary switch (a 10WA356 from Lorlin-UK). The Lorlin switch has a slightly different pinout than that shown for the Jameco 101566 switch in the Gristleizer assembly diagram, but I used an ohmmeter to determine the proper wiring. Hey Olivier – could you expand a little on what you did to add the CV in and out connections? 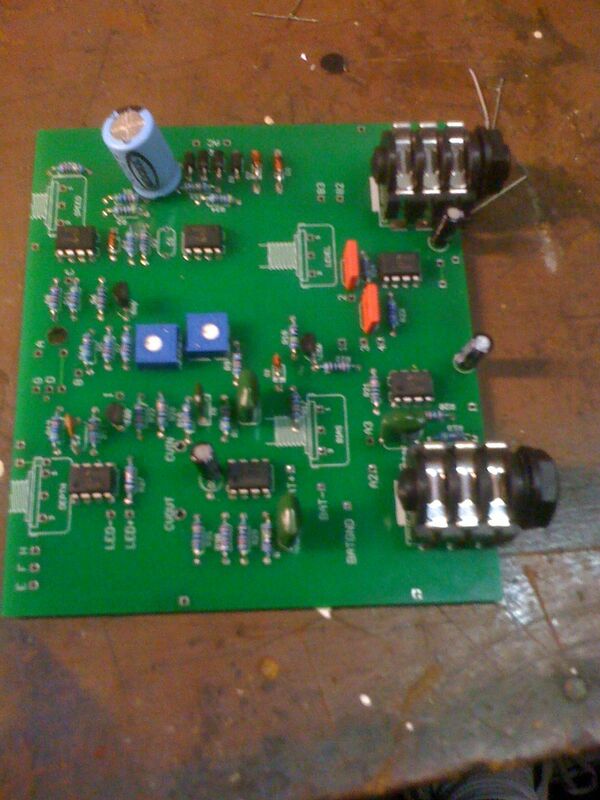 Hi Kerry, I wanted to ask about the 4 position rotary, was this pinout/wiring successful? I have a lorlin switch with the same pinout so just thought I would check with you whether you got it working with this wiring?